Belgian seventh seed Kim Clijsters beat compatriot Justine Henin-Hardenne 7-5 6-1 to take the Rogers Cup in Toronto. 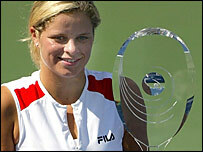 On-form Clijsters captured her sixth title of the year in just 71 minutes and has now won 35 of her last 36 matches in North America. The victory will boost her confidence ahead of this month's US Open, where she targets her first Grand Slam title. The Belgian rivals had not met since Henin-Hardenne beat Clijsters in the 2004 Australian Open final. "I was seeing the ball really well today," said Clijsters. "I knew I needed to be aggressive. There was a lot of wind out there. They were not easy conditions."